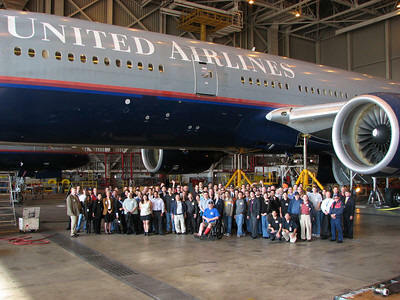 February 26, 2010 - United Airlines has finalized an order for 25 Boeing 787-8 Dreamliner aircraft. The agreement includes the opportunity to purchase another 50 Dreamliners. "Boeing and United Airlines share an 80-year partnership," said Jim Albaugh, president and CEO of Boeing Commercial Airplanes. "United, which launched the Boeing 777, now begins a new chapter with the 787 Dreamliner, the most technologically advanced commercial jetliner ever built." The order is valued at $4.2 billion at average list prices. "United's Boeing 787 order represents a substantial investment in our future and will enhance the significant progress we are making in improving the global competitiveness of our company while providing the opportunity to open new profitable markets and serve a broader range of international destinations," said John Tague, president of United Airlines. United expects to take delivery of the Boeing 787s at the same time it will begin to retire its Boeing 747s and 767s operating on international routes. The 787 Dreamliner, currently in flight test, will provide greater fuel efficiency, allowing airlines to add new, nonstop city pairs and the additional frequencies that passengers prefer. The Boeing 787 Dreamliners also promises a more comfortable flying experience for passengers. Its innovations include a new interior environment with improvements in air filtration, higher cabin pressurization resulting in reduced physical fatigue, larger windows, more stowage space, improved lighting and other passenger-preferred conveniences. The technologically advanced 787 will also provide airlines with up to 45 percent more cargo revenue capacity Including United Airlines, 57 customers around the world have ordered 876 Dreamliners, making the 787 the fastest-selling new commercial jetliner in history. The Boeing 787 Dreamliner is a mid-sized, wide-body, twin-engine jet airliner under development by Boeing Commercial Airplanes. It will seat 210 to 330 passengers, depending on variant. Boeing states that it will be the company's most fuel-efficient airliner and the world's first major airliner to use composite materials for most of its construction. Its development has involved a large-scale collaboration with numerous suppliers. The Boeing’s 787 Dreamliner is powered by two Rolls Royce Trent 1000 engines, the latest generation in the successful Trent family. The Trent 1000 is the latest member of the Rolls-Royce Trent family to take to the skies. Trent engine technology has accumulated more than 37 million flying hours since the first Trent entered service in 1995. At take off each Trent 1000 engine generated as much power as 1,000 family cars. Rolls-Royce has a long track record of reducing the environmental impact of its products and developing new low emission products, while maintaining exceptional operating performance. The Trent 1000 is playing a key role in enabling the Dreamliner to reach its environmental targets. Engine development has involved more than 10,000 cycles of testing over 5,500 hours. In November Rolls-Royce announced the successful completion of 3,000 cycle ETOPS (Extended Range Twin Operations) testing on the engine. United Airlines, a wholly-owned subsidiary of UAL Corporation, operates approximately 3,300 flights a day on United and United Express to more than 230 U.S. domestic and international destinations from its hubs in Los Angeles, San Francisco, Denver, Chicago and Washington, D.C. With key global air rights in the Asia Pacific region, Europe and Latin America, United is one of the largest international carriers based in the United States.